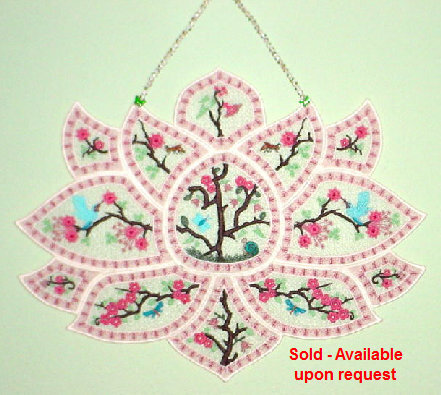 This wall hanging is a free standing lace design. It is embroidered on a water soluble sheet, that when washed away, you are left with a beautiful embroidery that has a stiffened, lacey appearance. This was done in 13 parts and sewn together. Colors are shades of mauve, green, and blue, on antique white. There are 2 green glass beads, with small hand-painted glass cloissonne beads that have seafoam green and mauve flowers, outlined in gold on a white background. Embroidery measures approximately 18" across and 14" in height. This would also make a great "sun-catcher" for a larger-sized window. This design can also be embroidered on tablecloths and the sections done on napkins. Will take custom orders for different colors.